The Global Navigation Satellite System (GNSS) is a constellation of satellites providing a high-frequency signal that contains time and distance that is picked up by a receiver thereby. [Figure 9-26] The receiver that picks up multiple signals from different satellites is able to triangulate its position from these satellites. Figure 9-26. A typical example (GNS 480) of a stand-alone GPS receiver and display. Three GNSSs exist today: the GPS, a United States system; the Russian GNSS (GLONASS); and Galileo, a European system. GLONASS is a network of 24 satellites that can be picked up by any GLONASS receiver, allowing the user to pinpoint their position. Galileo planned to be a network of 30 satellites that continuously transmit high-frequency radio signals containing time and distance data that can be picked up by a Galileo receiver with operational expectancy by 2013. 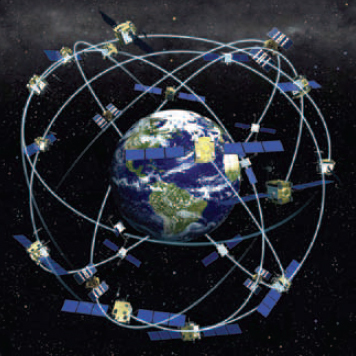 The GPS came on line in 1992 with 24 satellites and today utilizes 30 satellites. Figure 9-27. Typical GPS satellite array. The Department of Defense (DOD) developed and deployed GPS as a space-based positioning, velocity, and time system. The DOD is responsible for operation of the GPS satellite constellation, and constantly monitors the satellites to ensure proper operation. The GPS system permits Earth-centered coordinates to be determined and provides aircraft position referenced to the DOD World Geodetic System of 1984 (WGS-84). Satellite navigation systems are unaffected by weather and provide global navigation coverage that fully meets the civil requirements for use as the primary means of navigation in oceanic airspace and certain remote areas. Properly certified GPS equipment may be used as a supplemental means of IFR navigation for domestic en route, terminal operations and certain IAPs. Navigational values, such as distance and bearing to a WP and groundspeed, are computed from the aircraft’s current position (latitude and longitude) and the location of the next WP. Course guidance is provided as a linear deviation from the desired track of a Great Circle route between defined WPs. GPS may not be approved for IFR use in other countries. Prior to its use, pilots should ensure that GPS is authorized by the appropriate countries. GPS consists of three distinct functional elements: space, control, and user. The space element consists of over 30 Navstar satellites. This group of satellites is called a constellation. The space element consists of 24 Navigation System using Timing and Ranging (NAVSTAR) satellites in 6 orbital planes. The satellites in each plane are spaced 60° apart for complete coverage and are located (nominally) at about 11,000 miles above the Earth. The planes are arranged so that there are always five satellites in view at any time on the Earth. Presently, there are at least 31 Block II/IIA/IIR and IIR-M satellites in orbit with the additional satellites representing replacement satellites (upgraded systems) and spares. Recently, the Air Force received funding for procurement of 31 Block IIF satellites. The GPS constellation broadcasts a pseudo-random code timing signal and data message that the aircraft equipment processes to obtain satellite position and status data. By knowing the precise location of each satellite and precisely matching timing with the atomic clocks on the satellites, the aircraft receiver/processor can accurately measure the time each signal takes to arrive at the receiver and, therefore, determine aircraft position. The control element consists of a network of ground-based GPS monitoring and control stations that ensure the accuracy of satellite positions and their clocks. In its present form, it has five monitoring stations, three ground antennas, and a master control station. The user element consists of antennas and receiver/processors on board the aircraft that provide positioning, velocity, and precise timing to the user. 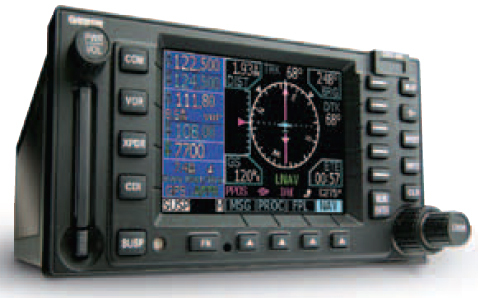 GPS equipment used while operating under IFR must meet the standards set forth in Technical Standard Order (TSO) C-129 (or equivalent); meet the airworthiness installation requirements; be “approved” for that type of IFR operation; and be operated in accordance with the applicable POH/AFM or flight manual supplement. An updatable GPS database that supports the appropriate operations (e.g., en route, terminal, and instrument approaches) is required when operating under IFR. The aircraft GPS navigation database contains WPs from the geographic areas where GPS navigation has been approved for IFR operations. The pilot selects the desired WPs from the database and may add user-defined WPs for the flight. Equipment approved in accordance with TSO C-115a, visual flight rules (VFR), and hand-held GPS systems do not meet the requirements of TSO C-129 and are not authorized for IFR navigation, instrument approaches, or as a principal instrument flight reference. During IFR operations, these units (TSO C-115a) may be considered only an aid to situational awareness. Prior to GPS/WAAS IFR operation, the pilot must review appropriate NOTAMs and aeronautical information. This information is available on request from an flight service station (FSS). The FAA does provide NOTAMs to advise pilots of the status of the WAAS and level of service available. GPS operation is based on the concept of ranging and triangulation from a group of satellites in space that act as precise reference points. The receiver uses data from a minimum of four satellites above the mask angle (the lowest angle above the horizon at which it can use a satellite). The aircraft GPS receiver measures distance from a satellite using the travel time of a radio signal. Each satellite transmits a specific code, called a course/acquisition (CA) code, which contains information about satellite position, the GPS system time, and the health and accuracy of the transmitted data. Knowing the speed at which the signal traveled (approximately 186,000 miles per second) and the exact broadcast time, the distance traveled by the signal can be computed from the arrival time. The distance derived from this method of computing distance is called a pseudo-range because it is not a direct measurement of distance, but a measurement based on time. In addition to knowing the distance to a satellite, a receiver needs to know the satellite’s exact position in space, its ephemeris. Each satellite transmits information about its exact orbital location. The GPS receiver uses this information to establish the precise position of the satellite. Using the calculated pseudo-range and position information supplied by the satellite, the GPS receiver/processor mathematically determines its position by triangulation from several satellites. The GPS receiver needs at least four satellites to yield a three-dimensional position (latitude, longitude, and altitude) and time solution. The GPS receiver computes navigational values (distance and bearing to a WP, groundspeed, etc.) by using the aircraft’s known latitude/longitude and referencing these to a database built into the receiver. The GPS receiver verifies the integrity (usability) of the signals received from the GPS constellation through receiver autonomous integrity monitoring (RAIM) to determine if a satellite is providing corrupted information. RAIM needs a minimum of five satellites in view or four satellites and a barometric altimeter baro-aiding to detect an integrity anomaly. For receivers capable of doing so, RAIM needs six satellites in view (or five satellites with baro-aiding) to isolate a corrupt satellite signal and remove it from the navigation solution. Generally, there are two types of RAIM messages. One type indicates that there are not enough satellites available to provide RAIM and another type indicates that the RAIM has detected a potential error that exceeds the limit for the current phase of flight. Without RAIM capability, the pilot has no assurance of the accuracy of the GPS position. Aircraft using GPS navigation equipment under IFR for domestic en route, terminal operations, and certain IAPs, must be equipped with an approved and operational alternate means of navigation appropriate to the flight. The avionics necessary to receive all of the ground-based facilities appropriate for the route to the destination airport and any required alternate airport must be installed and operational. Ground-based facilities necessary for these routes must also be operational. Active monitoring of alternative navigation equipment is not required if the GPS receiver uses RAIM for integrity monitoring. Active monitoring of an alternate means of navigation is required when the RAIM capability of the GPS equipment is lost. In situations where the loss of RAIM capability is predicted to occur, the flight must rely on other approved equipment, delay departure, or cancel the flight.